Mark your calendars for December 3rd! 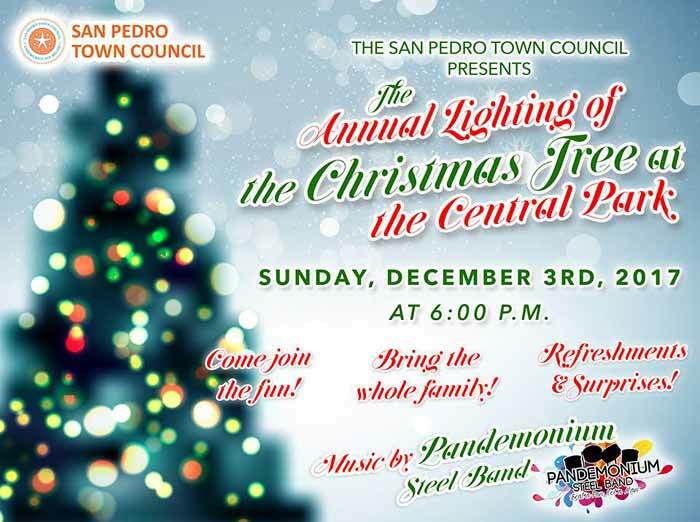 The San Pedro Town Council invites everyone to come out and witness the Annual Lighting of the Christmas Tree at the Central Park, starting at 6:00 p.m. There will be entertainment by the schools of San Pedro and a live steel band by Pandemonium Steel Band! There will also be refreshments and surprises! Hope to see you there! Bring the whole family and take your picture in front of the Christmas Tree! See you there! The popular Pandemonium Steel Band joins San Pedro in opening the Christmas season! ‘Tis the Season to be Jolly! The San Pedro Town Council held its official lighting ceremony of the Town’s Christmas Tree on Sunday, December 3, 20017 at the Central Park. 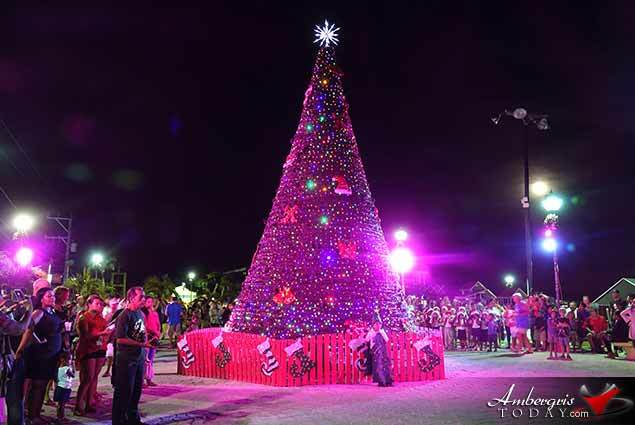 It was fun filled event which island residents and tourists enjoyed as they joyfully counted down together for the lighting of the Christmas Tree. Lady Dixie Bowen addressed the crowd and briefly related as to how her late husband, Sir Barry Bowen and their daughter, Courtney Bowen began the tradition of the lighting of the Christmas Tree. After the formalities students from different schools performed songs and dances for the festive occasion. The main performance for the evening was the Pandemonium Steel Band who delighted the crowd with Christmas songs and other Caribbean beats. San Pedro Town officially welcomed the Christmas season at their annual ‘Lighting of the Christmas Tree,’ ceremony held on Sunday, December 3rd. Shortly after 6PM, hundreds of island residents flocked to Central Park to witness the ceremony that brought much Christmas spirit. Officiating the ceremony was Miss San Pedro 2017-2018, Virginia Vasquez, who welcomed everyone to the celebration. The occasion saw a line-up of cheerful presentations by students from various schools on the island. Giving the official remarks was Mayor Daniel Guerrero, who thanked everyone for attending the traditional festivity. “When we turn on the lights on this beautiful Christmas tree, we will be sending the message of love, joy, and peace,” said Guerrero. “At this moment all over the world, we are all looking forward to peace. Christmas is a time when we all come together to share and care especially for the needy and the less fortunate and who are ill and hungry. We need to be there for them not only for Christmas but every single day.” Guerrero then led the countdown that set aglow to thousands of colorful lights that illuminated the tall Christmas tree.